Several cities surrounding Des Moines and Iowa City make up the top 10 places in Iowa, according to a blog post from an online real estate brokerage. Patrick Brown is with Movoto Real Estate, based in San Mateo, California. He says the “number one spot” in Iowa is Waukee, followed by North Liberty at number two. Johnston, Grimes, Clive, Norwalk, Ankeny, Urbandale, Pleasant Hill and Coralville completed the top 10. Movoto bloggers recently started ranking the top cities for each state. Iowa is just the third state to be evaluated, based on seven criteria: unemployment rate, cost of living, crime rate, high school graduation rate, median household income, median home value, and median rental price. “We basically rank each city on those individual categories and then take the average of those rankings to make what we call the ‘Big Deal Score’ and it’s kind of like golf, who ever has the lowest score wins,” Brown says. 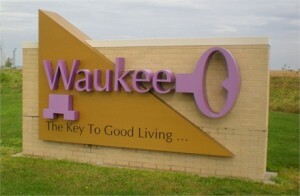 The Movoto report shows Waukee posted some of the lowest scores in nearly every category. 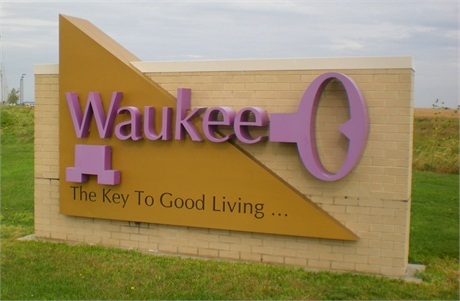 “(Waukee) ranked in the top 10 with high school graduation rate, the median household income and home values,” Brown says. Movoto’s rankings of the top places in Iowa only involved cities with populations of over 5,000 people.